John shows us how the professionals take care of odors on Yachts and how this can relate to your pleasure craft. Also John and crew teaches boaters the fastest and most economical ways boaters can bottom paint their vessels. How do you protect your boat at the dock from major tide swings and bad weather? The answer is here in this informative episode of Ship Shape TV! Also in this half hour, John has a new protective cover made for his wife’s personal watercraft. This time the G-Man teaches how to graft in an original piece of an inner-liner back into the boat by doing a structural fiberglass repair. Also, learn about a special “foam non-skid” for aluminum. From Bow Rails to Paint Jobs, John shows us how you can save big money by going surplus. Watch the SSTV crew this week remove an engine bracket using the help of Debond, a product that dissolves permanent adhesive upon contact. John will also visit a marine jewelry making facility, owned by Nature Craft Stores, and learn how custom nautical jewelry is made for company logos! Sick of that old rusty, worn out mooring cover? In this episode learn the best, most economical way of replacing this much-needed boat accessory. Afterward, John heads to a dock in Naples, Florida to learn about an amazing new system that protects your boat on a floating dock! Outboard engine owners rejoice! In this half hour, The G-man, along with the pros at Boats.net, teach us step by step how to replace prop shaft seals on an outboard engine. Also covered are thermostats and thermostat housings and fuel pump replacement. Installing new rub rail on the Taco Marine Project Charity Boat. This special rub rail has LED Navigational lights built right in! Part 2 in this informative series on wiring your boat yourself. Learn from the pros all the connections, tricks, and fixes that make for a clean “spot on” wiring job! Also John has a special guest on that has an exciting new Umbrella product for your boats! Want to update your out of style hardtop? Well in this exciting episode of Ship Shape TV, the Taco Marine Project Charity Boat gets its hardtop completely refabricated from scratch. Learn how the Pros design and Weld this important structural piece for your vessel! The 57′ Monterey Sportfish has dangerously been leaking fuel into its bilge and something must immediately be done about it! In this episode, John calls the experts, LukFuel, to not only remove the fuel from the bilge, but to also completely polish the fuel in the tanks and return it to the boat. Also there is a problem with a fuel tank that got loose on another boat and the crew show you what can be done about that. The we look into a new age anchor for your vessel. John Greviskis takes a trip to Newport, Rhode Island for the 2016 Newport International Boat Show and shows us why its one of his favorite places in the nation to visit! Not only do we visit the boat show, But John also take us on a tour of the area showing us the unique history of the area, and how it relates to pleasure boating through the ages, as well as all the sights and sounds of this culturally rich city… from restaurants, hotels, to a trip on a lobster boat! In a world that is constantly changing with the tides and landscapes, it is with the utmost importance to have a chart plotter and navigation system that constantly updates with it! In this episode, John learns just how easy it can be to have a real time updated navigation system; which is also specific for your area with remarkable detail. Also… in another project boat… the crew needs to remove a gas tank that has loosened up underneath the deck of this vessel. A new product is introduced which can literally dissolve 2-part polyurethane foam and make removing a gas tank actually easy! John visits IBEX, or specifically SeaDek at IBEX and discovers the latest technologies in non-skid foam manufacturing and installation. He installs some of these new foam pads on a friend’s boat. Have a hard to find boat replacement part you need for your boat? 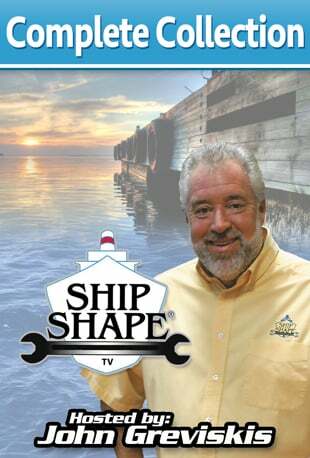 In this packed half hour of Ship Shape TV, John discovers a company that can pretty much handle any boat part request… no matter how difficult! Also… John checks out several hatch replacements for a project boat. Learn how to prevent corrosion from forming on a brand new aluminum fuel tank. Also watch how the SSTV crew replaces stringers and bulkheads without having a hull twist. This episode also shows you the professional way to foam a tank in and seal it permanently down below deck. Its time to see how the Professionals can save boater’s time and effort when it comes to wiring up a boat. John takes a trip to a Pacer Group factory and is lessoned step by step how wiring harnesses are crafted, made, and installed! This half hour, John shows how to polish a dull fiberglass T-Top. Then Learn how to dress up the inside of a cabin by making and installing a Hull liner. Also learn how to Mac-Daddy your dock Boxes with a Vinyl Wrap. Then lastly, John teaches boaters about installing port lights for the hull side.